Three Dolphins isn’t only gorgeous inside, it also has amazing ocean and mountain views. The villa has all the modern amenities you want, like Roku TV and a sound system, but also has classic Caribbean mainstays like beach access and al fresco dining. The owner is open to special events, so you can even consider this for a small wedding! 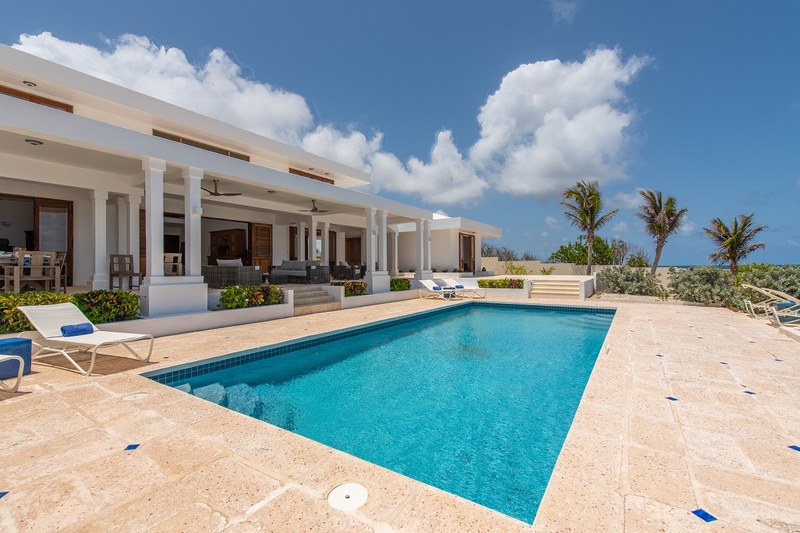 Three Dolphins is a beachfront estate in Blowing Point, Anguilla. This 5,000 square foot home is elegantly furnished and designed with rich wood, wrought-iron, and metal finishes. Blowing Point’s beaches feature soft, white sand and great surf. Three Dolphins has a small, sandy cove with a strip of rocks and foliage along the shore. Snorkeling lies beyond the rocks, and there’s an outdoor shower for washing off the sand. The stone pool deck has loungers, al fresco dining, and two levels. The lower level holds the pool and lounging chaises, and the upper level is a covered veranda with living and dining space. There’s also a breakfast bar outside the kitchen, connected by a pass-through window. A vegetable and herb garden are to the side, and there’s a four-burner outdoor grill for cooking up any produce that’s ripened. Every room has floor-to-ceiling ocean views. The living room opens directly to the veranda, and has a flatscreen TV and dining for 6. The air-conditioned kitchen has a coffeemaker, granite countertops, and GE Profile, Grohe, and Kohler appliances. Three walls of windows open to the sea, and there’s a pass-though window. All five bedrooms have king beds, air-conditioning, exterior access, cable TV, and an ensuite bathroom. Three are in the main house, and two are in the guest house. The guest house suites share a Jack & Jill bathroom. Daily housekeeping maintains the villa, and WiFi and a sound system are available throughout the home. The Anguilla Tennis Academy is three minutes away, and it is a five-minute drive to the golf course. Small weddings, family events, and celebrations can be hosted at the villa. pool size 40 ft. x 20 ft. This villa features waterfront access with direct access to a small beach. $3 per night per person Government Marketing fee. Car rental, private chef, butler, server, grocery and beverage shopping (pre-arrival and during your stay), liquor and wine delivery, nanny service, baby equipment, spa services, yoga and personal training, photography, and private airport transfer/car service can be arranged for an additional fee.